For Pancakes: Beat first 5 ingredients together thoroughly. Unlike standard pancakes, you want a smooth, lump-free batter. Heat a flat-bottomed skillet or crêpe pan over medium. Add a bit of butter, let melt, and pour approximately 1/2 cup of batter into pan, swirling pan to create an even coating. When edges are dry, carefully slide spatula around edges, then flip and cook for approximately 1 minute more. Remove to a warmed plate and repeat until batter is gone, adding more butter every few pancakes. For Filling: Gently wash mushrooms and pat dry. Slice in half lengthwise, then cut into thin vertical slices. Melt butter in a saucepan over medium heat. Add onions and cook until translucent. Add garlic and cook for about a minute more. Add mushrooms and cook for 5 minutes, stirring often. Add lemon zest, cream, and chives, and cook at medium for 5 minutes, then reduce heat and let simmer. Heat a skillet over medium and add a swirl of olive oil. Once heated, add spinach and stir to coat. Cook until spinach is wilted and reduced by half. To Assemble: Place 1 pancake on a plate. In the center, place a spoonful of spinach, then spoon over mushroom mixture. Fold edges over to create a square packet. Slide 1 chive underneath, then bring together and tie as if string. 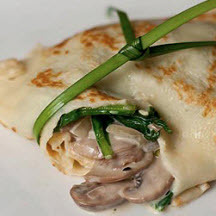 Alternately, place spinach and mushrooms in a strip down the pancake and fold sides together.